When you create a variable, or #define something, it would be nice if you could make a note / explanation for what you create. When you move the mouse over the name of the variable / const / define, a popup will display the text. It may already exist, but I haven't found it. Hi, if you use c++ code comments then visual studio will show them as tips. For example hovering i anywhere in the code would show the tip or hint "i is the count for x"
What I want is when I place the mouse on one of the 4 pieces. "Reset", then a small popup will open and display a text as I have written "example; This is reset button". I already use // or / * * /. If you already use /**/ or // why didn't you show that in your example? Which IDE and version are you using? The example you have shown me is, how I want it. 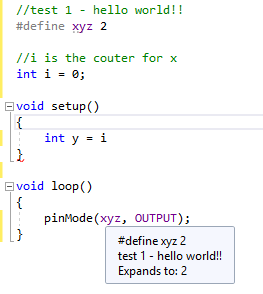 I have typed your example into IDE, and when I place the mouse on the xyz variable, only the text "#define xyz 2" appears in the popup, and no more. This is a feature of visual studio c++. Therefore your version of vs2015 is not providing this feature. Did you try 2017 or check for updates for Vs2015. I don't recall when Microsoft released the feature. I switched to 2017, so now it works.